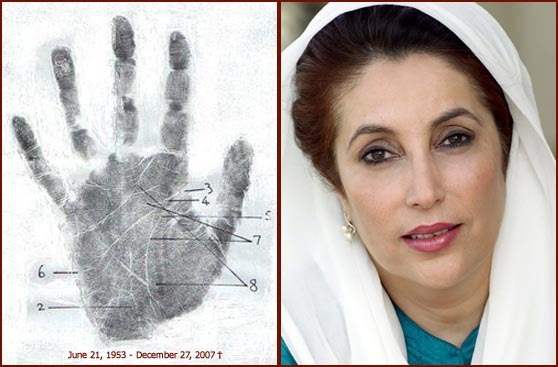 Benazir Bhutto's palm print below was taken after a University debate at Oxford and was the subject of much later Astrological analysis and debate in India and Pakistan. 1 - Her handprint shows an intuitive, intellectual and artistic communicator, As most Gemini's are. 2 - Experts in Dast Shanus, say when the fate line starts from the first bracelet, a fated or predestined life is inferred, and this is confirmed at the start of the lifeline, these small marks, often called the "lines of demarcation" give clues to the life to be lived, and the nature of its lessons. Muslims call this "quada wa quada". 3 - Surprisingly a nervous and shy child, several childhood illness's show here as upper respiratory infections, such as bronchitis, chest inflammation and sore throats up until the age of 12. 4 - At age 18 we have signs that romance is considered a lot at this time, first love and a feeling that someone on an intellectual par is paramount, this period climaxes at age 22. 5 - This need for education leads to her spending much time in Britain, where she was a well known speaker and author, and she also studied at Harvard in America, where she is remembered for being engrossed in political theories. Her eloquence and beauty made her a big star in the West, she knew her destiny lay with her people in Pakistan, and she and her mother endured the execution of her father and many terms of imprisonment. 6 - Exiled to Britain in 1986, she married Asif Ali Zadari in an arranged ceremony in 1987, and was elected as P.M at the age of 35 in 1988. Investigations began after Dassault armaments was caught offering large bribes for contracts, and intelligence community rumours of gold and currency dealing in Swiss bank accounts, this and offers of foreign investment led many to demand the truth. Her 20 years abroad, meant her Urdu was poor and it was known she had attended Christian meetings, this was construed by some as abandoning her heritage. 7 - Saturn afflicts her sun in 1999 so from this period she is on borrowed time, this coincides with her Saturn year age 44 and is an omen of what may come. Her assertion that when she is again in power, she will press for civilian rule and allow George Bush to bomb dissidents in Pakistan, angers many worldwide. The feeling of the U.S.A that certain countries will have democracy, or will be bombed into it, leads some to declare that while this occurs, British and U S citizens are daily having their democracy eroded, so what is it really about ? Although loved in Britain, she was seen by many at home as another foreign puppet, Remember that all India fought very bravely for Britain in W.W.II yet Winston Churchill refused to help in the Indian famine that killed millions, while sending huge amounts of help to the Soviets who were our intelligence services said; "more dangerous to Britain that Germany " The recent feeling was that the Indo/Pak subcontinent could do better without outside interference, the C.I A murder of General Zia did not help matters. 8 - The line colliding with the life line at age 54 tells of an assault on the life energies at that time, and the line after that point is weak. Some palmists claim you cannot see the future as the lines change, and some lines do actually change but in the second character only, the lines are indelibly printed on the hand from the first few weeks in the womb. This is a simplified palmascope for easy digestion, a full analysis is available, using Hindu, Muslim and Tibetan techniques, with western analysis. A great leader from a great family, her death has left a huge gaping wound across the world, her political shoes will be hard to fill. Psychologists tell us that men hear the laughter of a beautiful woman as sweet music, her music will play for me, for a very long time "Happy Palmistry"
* T. Stokes is known world wide as the "consultant palmist" and can work from emailed hand-prints. He offers a money back guarantee if not entirely satisfied. Benazir Bhutto was the first woman elected to lead a Muslim state, having twice been Prime Minister of Pakistan (1988-1990; 1993-1996). 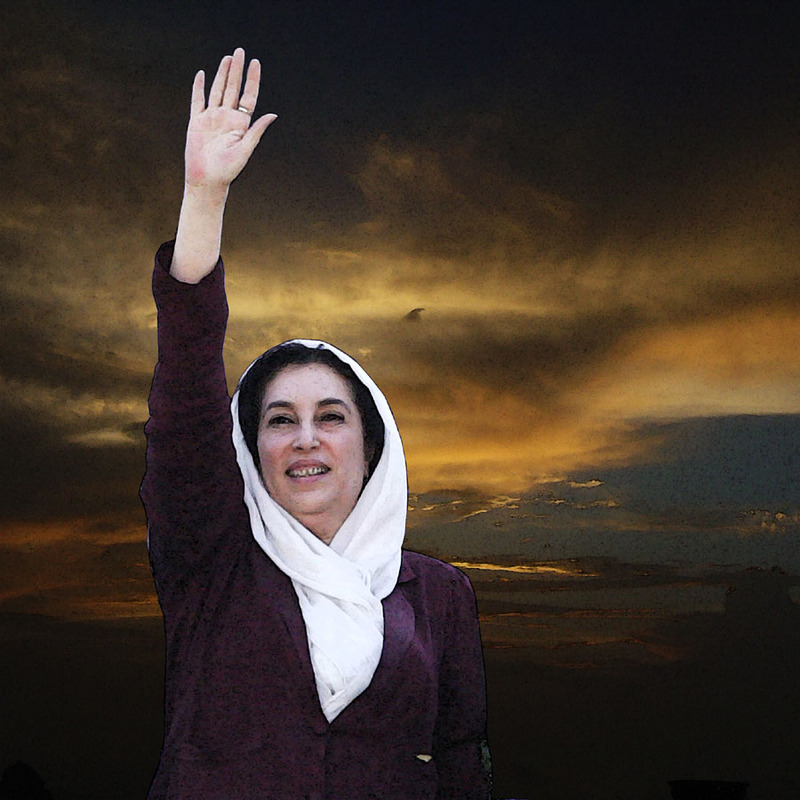 She was assassinated on December 27, 2007 - two weeks before the scheduled Pakistani general election of 2008 where she was a leading opposition candidate. Find a Palm Reader in Pakistan!